This entry was posted on December 17, 2014 at 1:00 am and is filed under Other People's Stories. You can follow any responses to this entry through the RSS 2.0 feed. You can leave a response, or trackback from your own site. 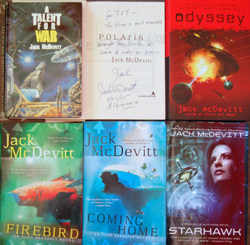 Jack’s my favorite sci-fi writer.. good interview! Awesome interview, Jane. Fascinating stuff. What a great interview. I’ve always loved Jack’s books, but I knew nothing of the person behind the words. Thank you for doing this. I was a newspaper reporter or 40+ years. You do interviews as good as I ever did and you’ve never been a reporter. It’s not fair. So as someone who’s never read anything by Mr. McDevitt, could I get two or three titles as recommended starting places? Thanks. Also, interesting statements on gender roles. Kind of depressing in some ways, though. I’ll have to try and watch my own interactions and make sure I’m not acting like that. Jack recently did a prequel to the Hutch novels that I really enjoyed and I think gives a good sense of what the novels about her are like. It’s called STARHAWK. POLARIS, which Jack mentioned above, is a good read. I also loved SEEKER.